Gurugram-based electric transport start-up Blu Smart Mobility is in talks with JioMoney, the digital wallet of the RIL group, and Reliance Jio, for data services across its offerings. Backed by Gensol, one of the largest solar energy service players, Blu Smart launched operations earlier this year, with a fleet of 100 Mahindra eVeritos. It is in talks with Coke to offer its seamless transportation solutions. The company also has a partnership with PayTM for online cashless payments in the National Capital Region (NCR) market. Through a tie-up with Jio, it wants to provide content, entertainment, and WiFi to its clients. “Jio and PayTM are promoting a cashless economy and we share the same vision with them. 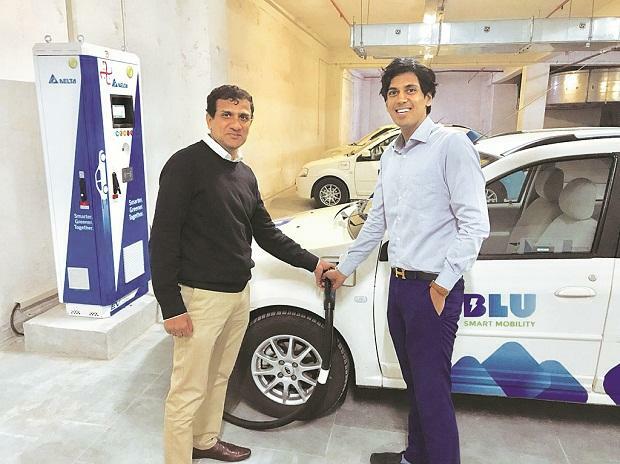 All of Blu Smart’s 100 cars in the NCR are powered by PayTM cashless payment services,” said Punit Goyal, co-founder, Blu Smart. Goyal said they were accelerating the adoption of shared mobility, electric sustainable mobility, seamless cashless payments, and high customer engagement by providing on-demand content and WiFi services in cars. The company plans to take the total number of Mahindra eVeritos to 1.200 besides inducting 300 Tata Tigor Electric cars and 25 BMWi3. “The plan is to scale up BMW i3 to 50 and induct 25 Jaguar I-PACE in 2019. The number of Jaguars will be scaled up to 100 in 2020. We will offer the high-end cars to corporate clients so that they are able to enjoy evolving technology and not buy a depreciating asset,” said Goyal. For its corporate clientele, it offers seamless transportation solutions. The company would start with 100 cars for Coke and would expand to 1,500 cars across several corporate clients. “There is a massive demand from them for seamless, affordable, on-demand, premium experience at economical rates for reliable and assured employee transportation service,” he said. Since running electric mobility service requires assured charging of vehicles, Blu Smart is setting up its own charging stations. These stations will be open for public fast charging as well. Currently, the company has 10 such stations in Gurugram but it plans to have 500 such shared charging platforms across the country by December 2019. Some of these stations will come in partnership with real estate developers such as the Lodha group in Mumbai. “These could be through a revenue-sharing model or depending, on time of the day, there could be no charge,” said Goyal. The charging stations will conform to Bharat Charge, Combined Charging System (CCS), and CHAdeMO standards. CCS standards are for European and American cars while CHAdeMO is used by Japanese, Korean and Chinese cars. It plans to introduce car-sharing services by May 2019 for intercity and intracity trips. The company is also looking at electric scooter sharing and electric bus and autorikshaw services.